Do You Need To Buy 10 Properties In 10 Years? Do You Need To Buy 10 Properties In 10 Years? Do You Need To Buy 10 Properties In 10 Years? A lot of people have the goal of 10 properties in 10 years. But will this goal actually help you achieve what you want? Do you need to buy 10 properties in 10 years? 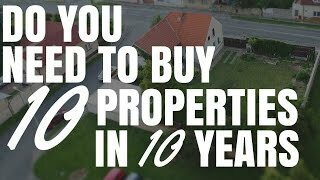 A lot of people out there have this goal of buying 10 properties in 10 years or they encourage people to have this goal of purchasing 10 properties in 10 years. Today, I want to ask the question, do you actually need to buy 10 properties and do you need to buy them in 10 years? So, let’s have a look at that. Let’s try and break it down and see do we actually need this to achieve what we want in our life? This is kind of carrying over from the last rant I did which is onproperty.com.au/345 where I talked about some alternative ways to think about financial freedom. And a lot of people think about financial freedom in terms of how much money they want to make, the lavish lifestyle that they want to have. However, if we can fast forward it and imagine ourselves as 80, 90, 100 on our deathbed and try and think back to our lives and think about the things that were important and meaningful to us, often we find that the cars, the mansions, the lifestyle – that’s not what’s important. It’s the family, it’s the community, it’s the positive you had on people. Well, that’s my story, anyway. Yours may be different. So, I wanted to analyze, do you need to buy 10 properties in 10 years? Because it’s a goal that a lot of people have and, look, it’s a great goal. But a lot of people just think, “Okay, I need to buy 10 properties in 10 years in order to achieve something.” and often, they don’t actually know what it is. What I would encourage you to do is actually go back, listen to onproperty.com.au/345 and listen to that episode there and try and work out, “Well, what do I actually need in order to be financially free and in order to at least get a base level of the life that I want?” Me and Ben Everingham, who’s the buyer’s agent from Pumped on Property, we talk about this often. We set goals for ourselves that are unachievable or we don’t have goals. Often, the easiest thing to do is to just say, “What is the income that I’m earning right now through my job and can I go about replacing that in terms of passive income?” and setting that as a goal. Because, at least then, when you reach that, you know you’ve replaced your income. You may not have the lavish lifestyle that you want, but at least you know that you’re now financially free and if you lost your job today, you’d be able to survive and you’d be able to live a pretty decent lifestyle. That can be a good goal to start with if you don’t have a goal or if your goal is too big. Maybe you want to start by looking at “Okay, well how can I replace my income through property investing first?” And then, once you’ve replaced the income, you can then move forward from there and begin to grow your wealth. Let’s look at how 10 properties in 10 years ties into this. Obviously, when we set a goal, ideally we want to have a timeframe on it and the earlier we achieve financial freedom, obviously, the better because it gives us more of our lives to enjoy. Buy why 10 properties? Why do we need 10 properties? Look, I don’t know. 10 is a nice round number and so, I think 10 properties in 10 years sounds achievable and it helps sell product, so maybe that’s why people have jumped on to this. But let’s analyze it and look at how much income do we actually need to survive and how are we going to go about achieving that? There was a story that I read in a real estate magazine years and years ago. I could never find the story again, but it was a little old lady who was financially free and independent on 2 properties. So she had 2 properties that was split into dual income properties, so they either had granny flats or they were split top and bottom so 2 people live in there. She rented 3 out and she live in one herself. Her and her husband had worked hard, they paid these off. So they were completely paid off and she was financially free from the 3 incomes she was deriving. And then, obviously, the almost-free accommodations she had because her house was completely paid off. I think one of the easiest examples to go through first is to say, “Okay, let’s say I own properties, how many properties do I need to own completely outright in order to achieve my goal?” I’m going to go into some math here and I’ll try and keep it simple so it’s not too confusing. So, let’s say that we want to achieve $60,000 per year in passive income, which is $5,000 per month. So we want to achieve $5,000 per month in passive income. How many properties will we need to own outright in order to achieve that passive income? So, $5,000 a month. Let’s work that out weekly because people pay rent by the week in Australia. So $5,000 times by 12. So $60,000 divided by 52. So we want to achieve $1,153 per week in order to achieve financial freedom. Now, if I had 10 properties, I would expect those 10 properties to each generate slightly over $115 per week because, obviously, you still got expenses like council rates and stuff and insurance to pay for your property. Let’s say we’re going to take 80% of rental income. Let’s say we need 10 properties and we need 80% of rental income we’re going to count, so I’ll divide this by 80 times by 100. So we would actually need $1,442 per week in rental income. Now, this means we’re earning that much, but we’re paying 20% in terms of expenses. So, at 10 properties, I’m only expecting these 10 properties that I paid outright completely to earn me $144 per week each. Now, how many properties out there can you go and rent as a tenant for $144 per week? I don’t know a lot of properties. There’s properties on the Gold Coast that tend to rent from $300 a week upwards. If you go to Sydney, I know people who are paying $450-$500 of 2-bedroom units in Sydney. So, where are you going to find a property that you’re renting for $144 a week? You’re not. So if you won 10 properties in 10 years, let’s say you owned them outright, the numbers just don’t stack up. You would earn way more money than you actually had as a goal. The reason we’re going this activity, and I know it’s getting a bit complicated, is basically we want to understand, at base level, how many properties will we need to own to achieve our goal if we can pay these properties outright. And then we can adjust that and stretch it out based on maintaining some mortgages and things like that. I’m going to work with an average income for each property at $350 per week. If I do $1442 divided by $350, then it’s 4.12 properties. So, really, with my assessment, if I wanted to earn $60,000 a year in passive income, I’d be looking at about 4-5 properties that were each earning at $350 a week in rental income, but they would need to be paid outright. So this idea of 10 properties in 10 years, well, you’re not actually going to need that to achieve financial freedom. There’s also ways you can do it with less properties by selling properties and then living off the profits that you have. So, we’ve got a goal of 4 or 5 properties paid completely outright. Then, our idea of 10 properties could come into play because we might want to buy more than 4 or 5 properties. And as the properties appreciate, we sell some and we use the money to pay off debt. Or maybe we keep them and they’re just not as much passive income comes from each property. This has gotten a bit confusing in terms of the math that we did. But the idea that I want to get across to you is that 10 properties in 10 years isn’t necessarily a goal that you have. You have a goal of the amount of income that you want to achieve in terms of passive income so you can go and live your life. So, I think Elon Musk, who’s the creator of Tesla Motors and SpaceX, he says that he calls it going back to first principle. He goes all the way back to the physics of things and starts from the very start and says, “Okay, here’s the physics of it. How can we move forward?” You can do the same with your property investing, to go all the way back to: “Okay, what do I want to achieve in my life? What’s going to make me happy and what’s going to make me feel fulfilled?” And then, you work forwards from there. And you can then say, “What’s the best way to achieve this? Is it passive income through property or is it adjusting my lifestyle and having my own business and living in a tiny house or something like that?” You then move forward and say, “Well, how much income do I need to do that? What kind of business could I start or what properties do I need to buy?” and you can move forward. I just want to help encourage you to get away from “X properties in X years” is going to deliver you perfect life. And to say, “Okay, what is perfect life for me?” and “What are some multiple different ways I can achieve that?” I hope that this encourages you today to go out and to understand what exactly you want and to actually create a strategy to move towards that. If you are stuck and you need help creating that strategy, then I am partnered with Ben Everingham from Pumped on Property who’s my buyer’s agent of choice. And he is offering 10 On Property listeners a month of free strategy session. So if you’re stuck and you need some help setting goals or you need some help finding good areas or good properties to invest in and you think you might want the help of a buyer’s agent to do that, I highly recommend Ben. You can go to onproperty.com.au/session and you can request a free strategy session over there. I do get a referral fee if you end up using Ben’s service. However, there’s obviously no pressure to do that. Sit down with him, talk about your goals. Talk about your step forward and if you’re a good fit with him and he can help you, then great. If you’re not, you can go on your merry way. I hope this is encouraging to you. Until next time, stay positive.